Serving Greater Cleveland & Northeast Ohio. What Are The Different Types of Indoor Shutters? Indoor shutters can be constructed for all types and sizes of windows in your house. But not all indoor shutters are equal. There are a number of different types of shutter to on the market, and different options within those categories with regards to construction, louver size, and more. Let's talk about the different choices you have for interior shutters, and how each one can benefit your home. Plantation shutters in Cleveland are the most desired type of shutters because they let in the light easily when open, block the most temperature when closed – and emanate beauty both ways. The wide louvers are one of the attributes that make plantation shutters stand out from other window treatments. The louvers range from 2.5” to 4.5” wide. The large louvers give you more view from your window and let more light into the home. Attaching the louvers together, the stiles are the solid vertical parts of the shutter panel, allowing for the movement of the louvers as one. We offer four superior types of indoor plantation shutters that are custom built to fit your windows perfectly: Polywood®, Ovation® wood, Reclaimed Wood, and Studio Shutters. Fashioned from a premium synthetic wood substitute, Polywood shutters won’t crack, split, warp, or chip. The superior colors on these indoor shutters won't fade or yellow when the sunlight touches them because of our unmatched baked-on paint finish infused with UV stabilizers. Ovation shutters are built by hand with furniture-grade teak and are offered in an array of stains to complement your present furniture and decor. Reclaimed Wood shutters are crafted from wood that was originally part of old buildings, fences and other structures. Every piece of wood is unique, and together they make a shutter that’s not only functional, but also a beautiful work of art on your windows. The newest addition to the Sunburst line, Studio Shutters are a basic plantation shutter that carries the same clean look as our Polywood shutters. With a few less options than other plantation shutters, Studio shutters are a great choice for homeowners who don't want to break the bank with their window coverings. If you want smaller louvers and a traditional look, colonial shutters are an older alternative for Cleveland. Their louver sizes typically range from 0.75” to 1.25”. 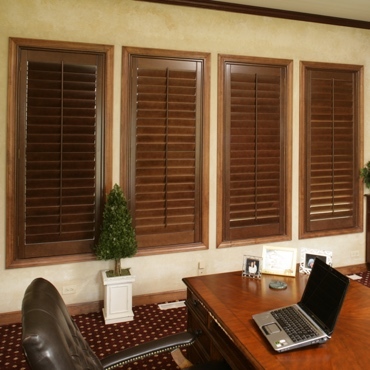 Between us, plantation shutters are the preferred shutters in Cleveland. When you want shutters that exude elegance and reduce your energy bills, louver size matters. Whereas colonial shutters are made with smaller louvers, Polywood and Ovation plantation shutters – which are built for beauty and energy efficiency – are top pick. And remember: larger louvers are a piece of cake to clean and adjust. Are the differences in shutters a little bit easier to see now? If you want any help with finding the best window treatment fit for your Cleveland home, call Sunburst Shutters Cleveland at 440-561-6787 for a free design consultation today. Since 2004, Sunburst Shutters Cleveland has been proudly associated with the Sunburst family, bringing true artistry, unfailingly original design, and individualized service to loyal clients from Terminal Tower to the Great Lakes. Sunburst Shutters & Window Fashions offers the Cleveland metro area the finest of beautiful, energy-efficient – and beautifully operational – plantation shutters. Contact us at 440-561-6787 or complete this form to have a Sunburst Shutters professional measure your windows today! Take the first steps to a brand-new look. Schedule a free in-home consultation with just your name and email or call 440-561-6787.